Proper break-in will provide you with a better running engine, it will also provide for considerably longer engine life. During the break-in, gently change RPM from idle to 3/4-throttle and back. 1. Run the engine, varying the RPM, for 2 minutes. 2. Stop the engine and let it cool off for 2 minutes. Check for loose bolts, etc. during this time. 3. Run the engine, varying the RPM, for 5 minutes. 4. Stop the engine and let it cool off for 5 minutes. Check for loose bolts, etc. during this time. 5. Run the engine, varying the RPM, for 10 minutes. 6. Stop the engine and let it cool off for 5 minutes. Check for loose bolts, etc. during this time. 7. Continue 10 minutes of running, 5 minutes of cooling until 30 minutes of run time is achieved. At this point, you can fly. However, avoid long periods of full power and vary the throttle setting often. For heavier pilots that require more power to fly, it is recommended that 1 hour of non-flying break-in be completed before flying. Break-in is complete after 10 hours of operation of the engine. 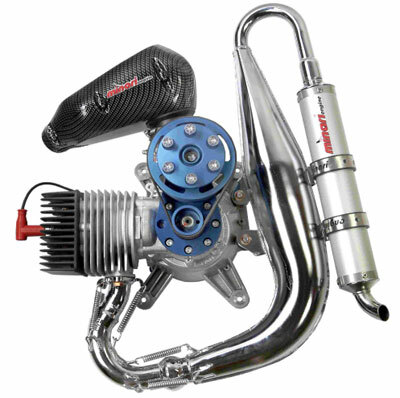 Also refer to the Minari Engine Manual for more information.